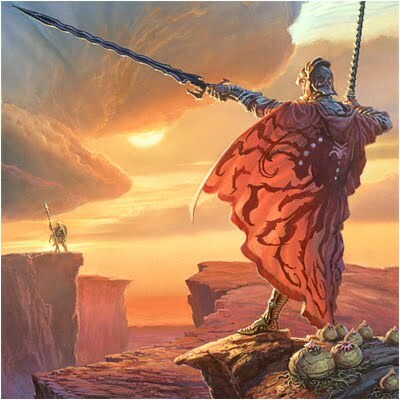 Brandon Sanderson emerged victorious at the David Gemmell Legend Awards in London last night. He won the award for The Way of Kings. Many congratulations to Brandon! Though this is slightly surprising, as it was assumed, due to the much larger Wheel of Time fanbase, that Towers of Midnight would be a better bet. It also means that the Wheel of Time, despite its immense popularity, still remains without a notable fantasy or SF award trophy to its name. It'll be interesting to see if A Memory of Light can end that drought. Congrats again to Brandon and his publishers. In other news, Darius Hinks won the Best Newcomer Award for his novel Warrior Priest, whilst the Best Cover Art award inexplicably went to the rather atrocious cover of Power and Majesty by Tansy Rayner Roberts (no, never heard of it either). Pornokitsch have the cover here, if you can bear to look at it. In addition, the auction to get your name into Scott Lynch's next-but-one novel raised a startling £1,200. Kudos to Brandon Sanderson. I really loved this book and like his writing in general. WoT, by Jordan or Sanderson, excels as a whole, not the singular books. There are also too many simply boring and longish books and the first book wasn't much more than a Tolkien ripoff either. It is the best book, the WOT one, doubtful, too difficult to save. I think the voting platform has problems - you can clean out your browser cookies and simply vote again. They need to have registered voters to choose a short list and then a panel to select the winner (or vice versa). I thought the award was for heroic fantasy, not most popular. What the...what's a cover like that even doing in contention?